Is hookah (hubbly bubblie) smoke better than cigarette smoke because it passes through water? No, the water does not clean the smoke. Hookah and cigarette smoke both contain poisons, including nicotine, tar, carbon monoxide, arsenic, and lead. Arsenic is used as a rat poison, and carbon monoxide is a deadly gas also found in motor car exhaust. Even in small amounts, lead can make children hyperactive, irritable and cause brain damage. Does one get less nicotine from a hookah than a cigarette? And what about carbon monoxide ? A hookah smoker takes about 100 puffs in a single (45 minute) session, while a cigarette smoker takes about 10 puffs per cigarette. In other words, smoking one hookah pipe can give you as much nicotine as smoking 10 cigarettes. Of course, it is the “tar” in tobacco smoke that causes cancer. The smoke produced in a typical hookah smoking session can contain about 36 times more tar, and about 8 times more carbon monoxide, than the smoke from a single cigarette. Is a hookah just as addictive as cigarettes? The hookah can be as addictive as cigarettes. Some hookah smokers show all the signs of addiction, they crave for a smoke. They cannot easily quit and have withdrawal symptoms when they stop. Why are young people taking up the hookah? The sweet flavour and pleasant smell makes it easier to inhale the smoke without coughing. Smoking hookahs is also a social activity. 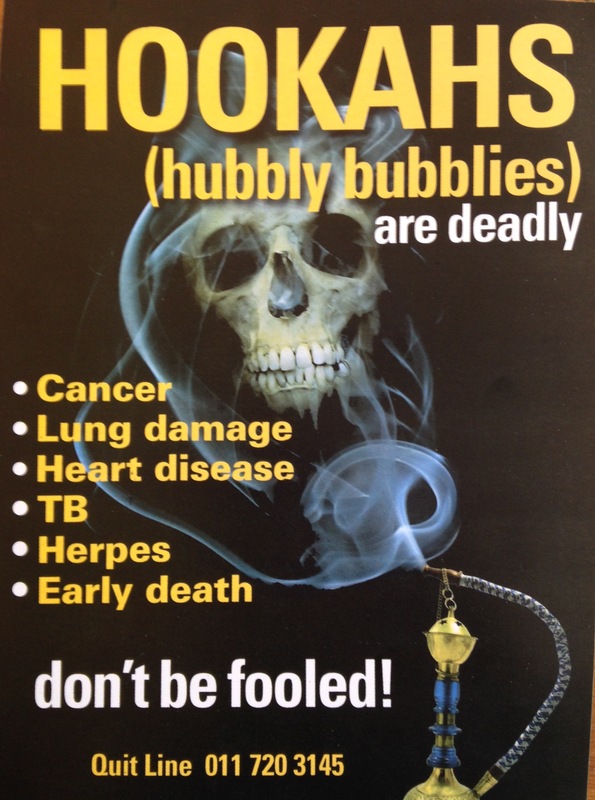 There is also the myth that the hookah is not harmful. So people think of the hookah as fun instead of a dangerous drug that can make you very, very sick. Is it safe for children to smoke the hookah? It is dangerous for anybody to use any form of tobacco, including the hookah. It is especially bad for young children because their lungs are still growing and smoking can cause permanent damage. What are the longterm health effects of hookah smoking? Does it cause impotence like cigarettes? It can damage your iungs. making it painful to breathe, it can cause cancer of the mouth, lungs and bladder, or a heart attack. Cigarette smoking causes impotence, wrinkling of the skin plus many other diseases Scientists are just now starting to investigate all the harms that hookahs can cause. Given its similarity to cigarette smoke, it is possible that many other diseases will be linked to hookah use. Sharing a hookah with others means you can get germs from other people The bacteria that cause TB or the virus that causes herpes can be passed on to you by sharing a hookah. If a pregnant women smokes can she harm her baby? Yes, The carbon monoxide and other poisons will pass from the mother’s blood to the unborn baby. Smoking a hookah during pregnancy can strain a baby’s growth. Even if I do not smoke, is it bad to be in a room where people are smoking a hookah? Yes, breathing the air in a room where people are smoking a hookah exposes non-smokers to many deadly chemicals This is harmful. Children whose parents smoke hookahs are more likely to have infections than children whose parents do not smoke hookahs.